Before the discussion started, US President Trump was shown as an example of a ‘tyrant’ comparable to Russia’s President Putin or Turkey’s Erdogan. 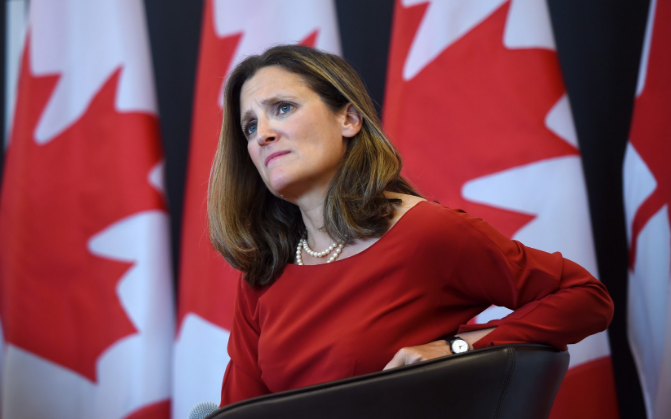 <a href="https://thegoldwater.com/news/37497-NAFTA-White-House-Not-Amused-As-Canada-s-Freeland-Compared-Trump-To-Tyrant"> NAFTA - White House ‘Not Amused’ As Canada’s Freeland Compared Trump To ‘Tyrant’</a>. Nine days have since passed, and the NAFTA negotiations are ‘stuck in neutral’ as it is called. With a White House self-imposed deadline possibly passing today, the reasons for this deal not going forward are many and varied. First off, the White House wants to get the deal done by 30 September, exactly one day before PM Trudeau’s Liberal party has an important election to pass in Quebec, where it is being threatened by a populist party. The news earlier this week that the Canadian Prime Minister wanted a meeting with US President Trump at the UN but that the latter had told him he ‘had not time,’ came as a sign to many that this White House administration is well aware of the size of the US economy versus the Canadian one and will not be pushed into a deal it does not want. Canada is offended that the so-called ‘Three Amigos’ deal between Mexico, the US, and Canada doesn’t seem to exist anymore as the US trade negotiator, Mr Robert Lighthizer, was able to sign a deal with Mexico without even mentioning the US’s northern neighbour. Mr Lighthizer, a trade lawyer originally from the American rust belt, and Ms Freeland, a former globetrotting journalist with a keen interest in foreign policy and multilateralism who authored a books on tax proposals (Plutocrats: The Rise of the New Global Super-Rich and the Fall of Everyone Else), don’t seem to understand each other all that well. In conclusion, it’s probably best to go with what Canada’s ambassador to the US, David MacNaughton, told a Toronto audience when asked what the chance of reaching a deal on Sunday was. He responded: “50/50”. hahahahahaha. Trudeau, the Man-Boy thinks Canada is tough. You are delusional and being run over by Muslims and soon there will be no more Canada. Dopey kid.